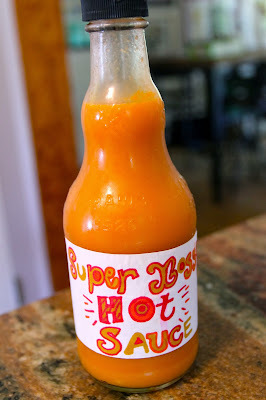 Okay, right off the bat, a confession: when my canners and I made this sauce, we didn't name it "Super Bossy Hot Sauce." I did that all on my own....because I'm bossy like that. I do think the name is fitting, though. Since this sauce "came of age" I have been putting it on everything. It's delicious. This was our first go at hot sauce and I have to say, it made me exceedingly happy. The whole started when I bought a jelly bag. Because "We Three Canners" needed one and I knew that we would find all kinds of awesome uses for it. We made pepper jelly right off the bat, which was fabulous. And then came this hot sauce. If you've never made hot sauce, I urge you NOT to be intimidated by it. It's pretty easy. It just takes a little bit of patience...which is the hard part because for me, patience is not my strong suit. But I digress. We used a variety of peppers from my friend Debbie. Aren't they positively gorgeous?! We decided that we would take our chances with how hot it would be...because the hotter, the better in my opinion! So we took our peppers, some garlic, and onion and sautéed them in olive oil. Then we added some water, and simmered it for 20 minutes. Then we let the whole thing come to room temperature and once it did, we added two cups of vinegar and blended it all with a blender. At that point, we put it in this jelly bag and allowed it to drain for about as long as you can stand to....which was probably about an hour. Once it's good and drained you are good to go. We split ours three ways and each made out with about a pint of hot sauce. YUM! Put it in an old Frank's Red Hot jar, like I did!!! You want to wait two weeks to use it. Let it get goooooood and ready! In a big pan heat the olive oil (you'll want a few tablespoons) over medium high heat. Add your peppers, garlic, and onion. Sauté for three minutes. Add the water to the pan and simmer about 20 minutes. When the 20 minutes are up, remove the pan from the heat and allow the peppers to come close to room temperature. 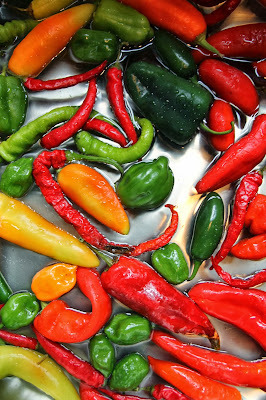 Once they have come to room temp, you want to blend the peppers with a traditional blender or an inversion blender while adding the vinegar. 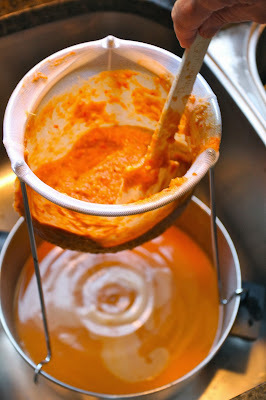 Once blended, add the whole mixture to the jelly bag with a pan underneath to catch the hot sauce. Allow it to drain as long as you have the patience to stand it, which for us was probably close to about an hour. We sort of pushed the contents around to get the juice out, and don't worry, that won't hurt a thing if you have to play with it, like us! Once it's done draining ladle your sauce into jars. If you want to process them, do so in a water bath canner for 10 minutes. If not, cap them and refrigerate them (which is what we did) for two weeks before using.